When most window cleaning companies clean windows on commercial buildings that have a lot of high windows, they either use tall ladders or boom lifts. Some times using these tools is necessary for the job. However, in many cases, there is a much more efficient and cost effective way to clean windows on multi-story buildings. This method is called a Water Fed Pole System and is offered to you by A Glass Act Window Cleaning. Clean filtered water is pumped through our water fed poles allowing us to safely clean windows up to 5-storeys with both feet on the ground. Soft bristle brushed gently scrub your windows and finally a quick rinse to finish the job, streak-free. 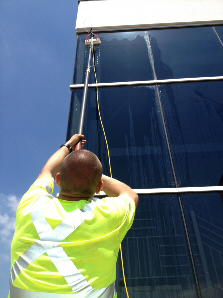 A Glass Act now also offers Window Cleaning for High-Rise buildings! Contact us for more information. Have you ever watched a window cleaner lean side to side on a ladder, 30 feet in the air while cleaning your windows. It can cause quite the disheartening feeling worrying about worker safety and liability on your property. The Water Fed Pole System from A Glass Act Window Cleaning alleviates those worries and ensures worker safety.